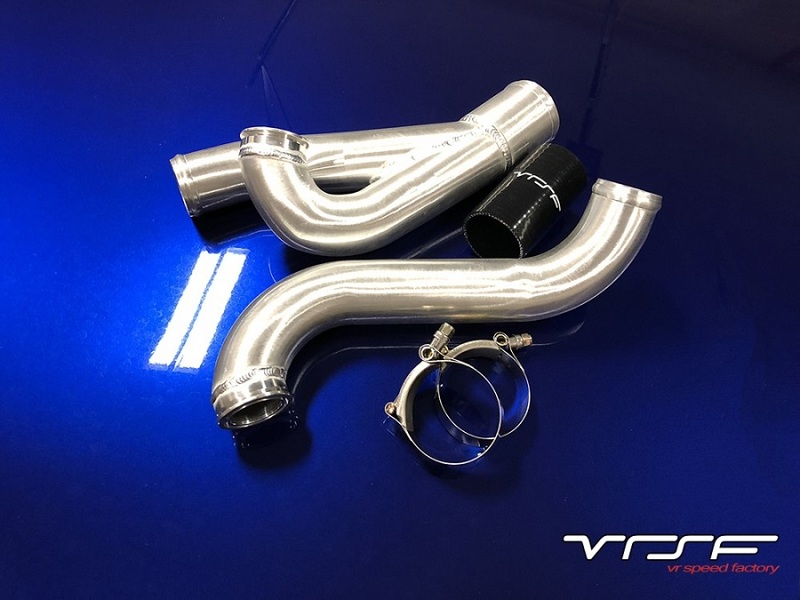 Increase throttle response, free up horsepower and decreases turbo lag with the high flow VRSF aluminum turbo outlet kit for your N54. The OEM turbo outlet necks down to less than 1" which can create a significant bottle neck on both stock and aftermarket turbos. This high flow outlet removes that restriction which not only offers an increase in HP but also allows the turbos to work more efficiently. Gains of up to 30whp have been realized by replacing the factory outlets with our upgraded outlets. This is a bolt on solution and does not require any additional components for installation. We include CNC machined steel v-band adapters that will work with both the OEM and upgraded turbos as well as the clamps necessary for installation. The outlet is composed of high temperature reinforced silicone and is specifically engineered to offer maximum clearance from the exhaust manifolds. The routing of our outlets prevents potential melting issues associated with other brands and offers maximum flow without sacrificing clearance. Note: This item will not fit RHD cars without modification. These outlets will only fit on N54 models. Fits every turbo and intercooler.